Cells of our immune system kill pathogens by enclosing them in a compartment called the phagosome. The phagosome undergoes programmed maturation, where the pathogen is degraded. Intimately linked to this degradation is active transport of the phagosome inside cells by nanoscale "Motor" proteins such as Dynein and Kinesin, which are force generators for many kinds of biological movements. Phagosomes carried by the Motors initially move in a back-and-forth manner near the cell periphery, and mature by fusing with other compartments. As time passes, there is a switch that causes the phagosomes to move in an almost unidirectional manner towards the cell centre. Here, they fuse with acidic lysosomes so that the pathogen can be degraded. The switch in the phagosome's motion is important for the degradation of pathogens as has been observed in the case of Mycobacterium tuberculosis and Salmonella who abort this switch as a strategy for survival and infection. Researchers at the Tata Institute of Fundamental Research now show that the "switch" in a phagosome's fate is because of the formation of cholesterol-rich domains called lipid rafts on the phagosome membrane. "We have found the transport of pathogens to lysosomes is achieved by the physical clustering of many nanoscale Dynein motors", says Professor Roop Mallik, the lead scientist of this study. Dynein motors cluster into these lipid raft domains, and by doing so are able to work cooperatively in large teams. 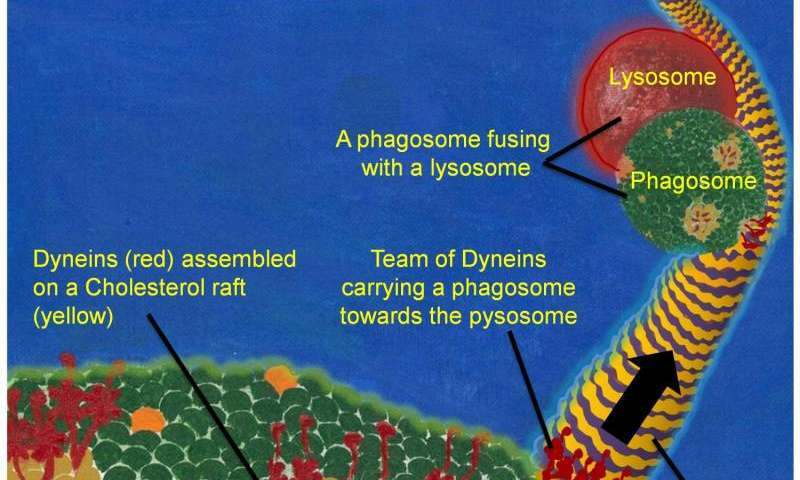 This cholesterol induced assembly of Dynein-teams transports the phagosome towards acidic lysosomes for degradation. The results of this study will be published in the February 11 issue of the journal Cell. Importantly, they also show that a lipid molecule from the parasite Leishmania donovani that causes Visceral Leishmaniasis (Kala-azar), a deadly disease endemic to many tropical countries including India, is able to disrupt the clustering of Dynein, and therefore prevent the transport of phagosomes towards lysosomes. This may be a mechanism by which Leishmania can spread infection by surviving and multiplying inside the immune cells of our liver and spleen. Says Professor Mallik, "This discovery may help devise treatment strategies against such dangerous infections. These results are also very relevant to the pathogens that cause Tuberculosis and Typhoid. Our work also shows how the much hated molecule cholesterol, can be useful in clearing infections."